Casa Blanca, a 3,000 sq. 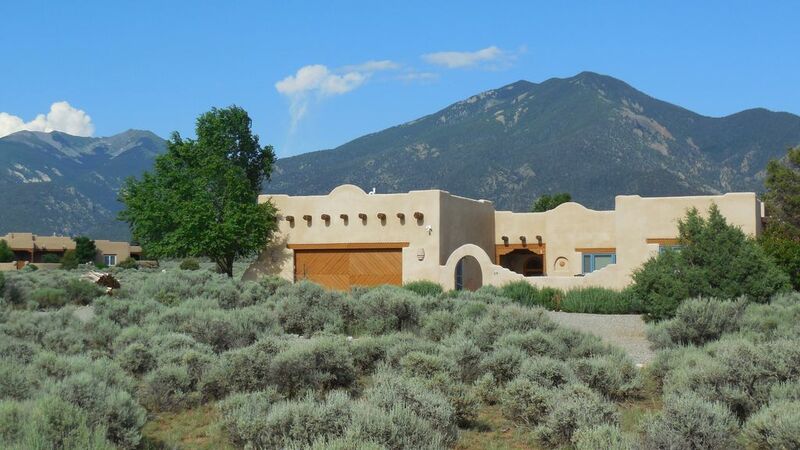 ft. classical southwestern adobe home exquisitely designed and furnished in the Santa Fe style. For the discriminate renter wishing to stay in the finest home available. Conveniently located between historic town of Taos ( 6 miles) and Taos Ski Valley ( 14 miles) off highway 150 two miles from 150,522 & 64 intersection . Located in a subdivision and surrounded by three open acres. Half mile from nationally ranked major tennis club. Great location for sports enthusiast as well as local amenities, restaurant, galleries & historic sites. Warm, bright, romantic with magnificent views of mountains or sunsets from every room. Three wing house design provides abundance of privacy. Outdoor hot tub and indoor Jacuzzi tub. Very large Master Suite with massive four poster log bed, fireplace and sitting area. 'Taos Blue Bedroom' has king bed made in Taos. 'Sunset Bedroom' has locally made queen iron bed and southwest iron decor. Viga and latilla ceilings throught home, two kiva fireplaces, new tile floors, fully tiled baths and kitchen. Enjoy the classic Southwestern kitchen, Southwestern tableware and warm dining area that seats eight. New professional cook top, oven, refrigerator and all new appliances. Recently upgraded with new High E heating system, tile floors and interior paint , high E washer & dryer. Sheets and towels Sanitized. Relax and experience the fantastic views. Four separate outdoor viewing/dining areas with fantastic views and new high quality patio dining sets. Two large walled in courtyards in front and back, separate garden seating. Large screen LCD TV, Dish Network with DVR, stereo, DVD, CD player entertainment center. Wireless internet for your use. Skiing, hiking, rafting, biking, tennis and golf are all close by. Top notch tennis center 3/4 mile away. Owner has experience visiting Taos for past 25 years. Avid skier, biker & hiker. Owner manages home and visits frequently. Local 'home care' assistants clean and ready home. Owner eagerly will provide information on travel, dining, entertainment and local activities. Bathroom # 2 is located near laundry room and master area. Stunning views of of mountains in all directions. Western views for 60 miles. New five burner professional Cooktop and oven dishwasher and refrigerator. (5) Five separate outdoor eating/viewing areas with new patio furniture. Two enclosed courtyards, one in front one in back plus outdoor garden patio. Major tennis club 1 mile away. An amazing house-comfortable and well equipped kitchen! Well situated for skiing as it is on the road to the ski area. Great restaurants nearby but we often like to dine in after a long day skiing. Excellent property. Stunning views via large picture windows. Very comfortable bed. House and hot tub very clean. Lots of hot water. Plenty of firewood. Heated tile floors are yummy for cold feet; I'm missing them already. Easy to communicate with owner. Just about everything you might need-- they even had yoga mats and a ceramic tea pot and tea cozy. Hope to be back! Casa Blanca is a beautiful home. The multiple outdoor seating areas provided spectacular views of the mountains and sunrises/sunsets. The location is very convenient for hiking in the ski valley and going into town. The house is well equipped and everything was in working order. We plan to return next summer. The house is very well provisioned with linens, food staples, gear, etc. We have stayed in Taos on dozens of occasions and this ranks up there with the best experiences. Thanks, Charlie! Casa Blanca is the best rental we ever experienced. Every detail was thought of by the owner. If visiting Taos, this is a must stay!!! Loved it. Maximum of 7 people including 2 children Discounts for less than five people.